26/47 Amanda Jones Who's not a sucker for disaster movies, even poorly written ones? 36/68 Michael Bentley If you don't mind a rather mindless popcorn movie that spans the emotions with excitement, humor, terror and tragedy, it might be right up your alley. 73/159 David Mumpower Freakishly loyal adaptation hits all of the original's high points while managing several clever new wrinkles. 88/200 Max Braden It's no Titanic, but I thought Kurt Russell was good in this, especially his last scene. For their tentpole summer 2006 release, Warner Bros is hoping that the return of one of the classic disaster films of all time will create a 90-foot tidal wave of cash. Everyone put on your life jacket as The Poseidon Adventure is back. And it's back with a vengeance. Thought by many to be the grand-daddy of all disaster flicks, The Poseidon Adventure begins as just another New Year's Eve cruise on a top-heavy ocean liner. One 90-foot tsunami-like tidal wave later and we have a handful of survivors now racing the clock through an upside down maze of a ship hoping to find some way out before the ship sinks completely. The original film, made in 1972 by Ronald Neame from the novel by Paul Gallico, took critics and movie-goers by storm, earning eight Academy Awards nominations and winning the Best Song Oscar as well as a Special Oscar for the Effects. The original featured one of the great ensemble casts of all time. Gene Hackman led the group, with supporting turns by Ernest Borgnine, Shelley Winters (Academy Award nominee, Best Supporting Actress), Red Buttons, Roddy McDowell, Jack Albertson and a pre-Frank Drebin Leslie Nielsen as The Captain. 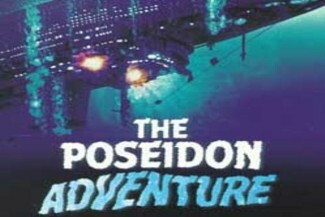 For those not familiar with the original, when you watch a film like Twister, The Perfect Storm, Volcano or any of the myriad of TV disaster movies, you can bet that there are scenes and cliches stolen straight out of The Poseidon Adventure. Moving on to the new version, Wolfgang Petersen is attached to the project as a producer, though there are currently conflicting reports about him directing. Also, cast signings include Kurt Russell, Richard Dreyfuss and Emmy Rossum, which looks to be setting in motion a pretty stellar starring group. Petersen knows a thing or two about the sea as he's helmed both The Perfect Storm and Das Boot. He also knows a thing or two about huge special effects, with The Perfect Storm grabbing an Oscar nod for effects in 2001. See the latest developments for this project on the Poseidon Movie News page.